Baby Fawn Found in Your Yard? Baby fawn’s look so cute, and so helpless. 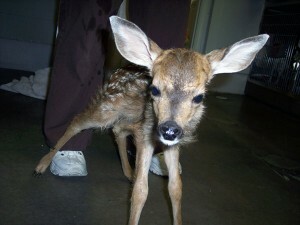 It is natural for us, when we see a fawn alone, to assume that it is abandoned and needs our help. The reality is usually very different. Does will leave their baby fawns “parked” in a safe place for up to 24 hours while they go out and forage for food. Unfortunately, the fawns often do not stay “parked”, and wander into our yards, looking for mom. If we simply LEAVE THEM ALONE, they will usually reunite with mom within a day. Even if something has happened to mom, the fawn will usually be adopted by a related herd member, such as an aunt or an older sister. If we step in and hand raise the fawn, like we are attempting for this abandoned triplet, it stands a slim chance of long-term survival in the wild. This is because they imprint easily, and can grow up thinking that all people are good and carry food. This leads them into close proximity with people, cars, dogs, and many urban dangers. Additionally, if the fawn reaches reproductive age, and has no fear of people, they become very dangerous, claiming “your yard” as “it’s territory”, threatening and even harming pets and children. Raising multiple baby fawns together helps to prevent imprinting, but has inherent problems as well. Deer from different herd groups or areas each have different diseases and resistances to disease, so bringing them together usually results in all fawns becoming sick. Even if we get them through this trying time, then we face the question of, “where do we release them?” Introducing these different diseases to a foreign herd can result in making an entire herd population sick. So, if you see a fawn by itself, PLEASE, wait 24 hours before you call Badger Run Wildlife Rehab, your local wildlife rehabilitator, or Fish and Wildlife office.. If, after 24 hours, the fawn is still alone, please, do not touch it, but call Badger Run Wildlife Rehab and let us come assess the situation and determine the best course of action to ensure the fawns best chance at a long and happy life. This entry was posted in Help Us Help WIldlife and tagged Baby Animal, Deer, herbivore, Mammals, white tailed deer. Bookmark the permalink. One Response to Baby Fawn Found in Your Yard?